Simple “in/out” upflow carbon filters offer an inexpensive way to remove chlorine or chloramine from city water. Among the simplest of water treatment devices, they require no electricity, no drain connection, no setup programming, no cartridges to change, and, for years, no upkeep. Our version of the in/out upflow is the best product we can make, and we think it’s the best anyone can make. Our in/outs feature the best parts available for simplicity of operation, long service life, effective performance. We use the superior Vortech mineral tank and the tough, reliable Clack In/Out Head. We provide a clear-bowl media trap to assure that no filter media enters the home’s service lines, plus a specially designed installation adapter to make startup of the filter easy. An optional bypass valve is sold separately. We suggest that a sediment filter be installed in front of all upflow filters to protect against sediment intrusion. The sediment filter is not included because individual customer preferences differ. The upflow style is used by some internet sellers for products promising “one million gallons” of service life. We make no such claims, but a four or five year service life before media change is to be expected if the filter is adequately sized. Our upflow units are straight carbon filters without mixed media or magic ingredients. We believe that media with different purposes, like descaling agents or KDF, should be, if the customer wants them, offered in a separate tank. We don’t like mixing media and we don’t like split-level tanks. 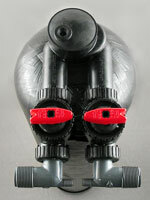 A Pure Water Products Upflow filter with the optional bypass (with red handles) installed. Upflow units need no drain connection, no electricity, and normally need no maintenance other than a media change after four or five years of service. Here’s a list of the standard residential sizes with the two most popular carbons. We also have regular carbon units (a bit cheaper than the coconut units priced below) and Jacobi Aquasorb Coconut Shell Catalytic carbon units (slightly cheaper than the Centaur units below). As a rule of thumb, use coconut shell or standard carbon for chlorinated water and Centaur (or Aquasorb) for water treated with chloramines. Home with 3 to 4 people. Home with more than 6 people. Home with 4 to 6 people. Bypass valve is included in prices on this page. If you do not want the bypass valve, subtract $37 from the price. For those who want to build a filter with their own ingredients. Full filter setup with tank, head, bypass, startup kit, 1″ threaded elbow extensions, but without filter media. Optional bypass for all sizes: Part #WH650: $37.